Most immigrants from Asia arrived at the port of San Francisco. 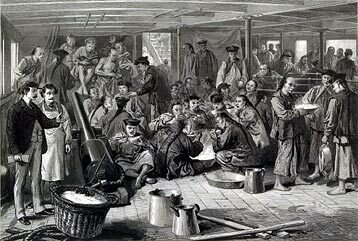 As soon as they began arriving in substantial numbers during the 1850s, the Chinese were targeted for discrimination in California. The local and state legislation passed in San Francisco and California between 1850 and 1880 is indicative of the strength of anti-Chinese feeling amongst West Coast Americans. This activity lists some of the city and state laws that aimed to deter Chinese immigration and restrict the lives of those who lived here. It also indicates what happened to many of these pieces of legislation. We suggest this activity be done as a class discussion. Put the list of local and state anti-Chinese legislation on an overhead projector. Cover the column of subsequent actions. Why were the city of San Francisco and the state of California so concerned with Chinese immigrants and workers? Many of these laws are indirectly aimed at the Chinese by targeting items used or ways of doing things that are considered typically Chinese—for example, the use of a specific type of net for fishing. What other items or customs are attacked by anti-Chinese legislation? Other laws make it clear that the Chinese were considered a separate race that should be segregated from whites and kept in an inferior position in society. Which laws emphasize the Chinese as a separate race unworthy of equal status with whites? What are the repercussions of a law that says Chinese can not testify in court against whites? Who would benefit from this legislation? Who would benefit from a Foreign Miners tax or from heavy taxes on laundries that use carrying poles rather than carts? How were the Chinese immigrants contributing to the economy and the development of California and the United States? Who benefited from their work? Why are these laws considered discriminatory? Do you think a city or state would pass or uphold laws or rules today that are so clearly aimed at restricting a specific group of people in our society? How could California pass laws like these in the 1880’s and 90’s? Do some of these conflict with the United States Constitution? What can people do when unjust laws are enacted? Uncover the column of subsequent actions. What inferences can the students draw from this information? The U.S. Constitution and the American legal system were able to offer some protection from the xenophobia and anti-Chinese feeling that were prevalent. The Chinese American community quickly recognized how to use the courts to counter the political and social hostility they experienced and to actively respond to unjust legislation. Despite the fact that most of this legislation was quickly struck down when challenged in court, the city council and state legislature were determined to continue writing and passing anti-Chinese legislation. This sustained effort over five decades indicates the overwhelming anti-Chinese feeling among the general population and the popularity and support politicians gained by pursuing these measures.